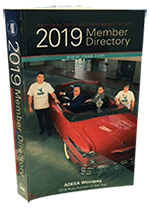 Each year the National Auto Auction Association produces a membership reference directory. The directory contents show NAAA national and international members in membership categories as auction (regular) members, corporate and associate (service & equipment) members with their location and contact information. Members (i.e., auction, associate and corporate) of the NAAA receive their copies of the directory in the beginning of each year. Members may order additional books by ordering online or download an order form for mailing or faxing. For special member prices, members are required to login first before online ordering or to obtain a fax/mail order form. Non-members can order the directory online or download a pdf form for faxing/mailing. All directory order quantities over 10 requires a phone call into NAAA headquarters at 301-696-0400 for bulk order shipping/handling discounts.